Hendrick’s Gin always like to amuse and to celebrate London Cocktail Week (6-12th October), our Hendrick’s friends are presenting The Boneshaker – the worlds first pedal-powered cocktail shaker. This curious contraption will park up at Brooks B1886 in Seven Dials, inviting discerning drinkers across the capital to lubricate the cogs of conversation at the Hendrick’s Boneshaker Cocktail Bar. 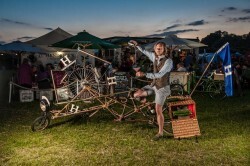 Combining the thrill of travel with the joys of post ride refreshment cocktail drinking, The Boneshaker uses the rotating motion of the cycle wheels to simultaneously create six most marvelously mixed Hendrick’s libations. On display in the Hendrick’s Boneshaker Cocktail Bar, cocktail enthusiasts can sample vigorously shaken Boneshaker Radlers, low alcoholic beer tipples and The Ramos Gin Fizz – a magnificent beverage that originally took a team of twenty ‘shaker boys’ up to twelve minutes to prepare to perfection, but with The Boneshaker it can be crafted with effortless ease. Hendrick’s also institutes the No Rush Hour Society, inviting all purveyors of the peculiar to raise a glass as the clock strikes six for the mystical cocktail hour, a most delightful ritual. Taking to the cobbled streets of Seven Dials, The Boneshaker will mix up a marvelous array of palate pleasing cocktails. Spaces to this unusual occurrence are limited and will be allocated on a first come first served basis from 6-7pm on Thursday 9th through to Sunday 12th October.